The madness for the Star Wars phenomenon has a new ally in Japan, a country that literally goes wild more than others with each news about the revival of the saga created by George Lucas and acquired years later by Disney. The design, to begin with, reflects the two sides of the Force: light and darkness. But this is just the beginning. 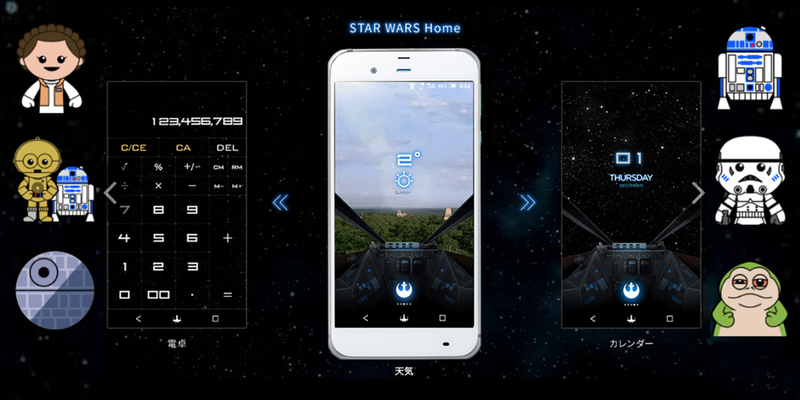 The last product of the Disney factory on Star Wars are two smartphones launched by the operator SoftBank to celebrate the premiere in cinemas of Rogue One: A Star Wars Story, the expected spin-off planned to be released on December 16. Made by Sharp, these cell phones are essentially distinguished by aesthetics. One is black and red, and destined for the followers of the Empire; the other is white and silver, and obviously destined for the followers of the Rebellion. If technically it is not particularly surprising (5.3-inch Full HD screen, Snapdragon 820, 3 GB RAM and 32 GB storage memory), both phones stand out for the presence of a TV tuner, a prehistoric relic we had forgotten, and many customizations of a device of this kind. On board of these two smartphones we find the Android operating system with Star Wars themes, a custom launcher, theme for the alarm clock, the wallpaper, personalized emojis, a collectible card game and even the sounds and soundtracks of the saga. Among the most interesting novelties, it is also noticeable to see on the back of the phone that it changes color depending on how they are clamped (or unwound). A real tribute to Star Wars on the part of Android, which also offers a free application that allows the viewing of Star Wars: The Force Awakens without limits until December 1, 2019.